Bushrangers Cave is named for the bushrangers who roamed the rugged Abercrombie Ranges in 1830, and used the cave as a shelter. 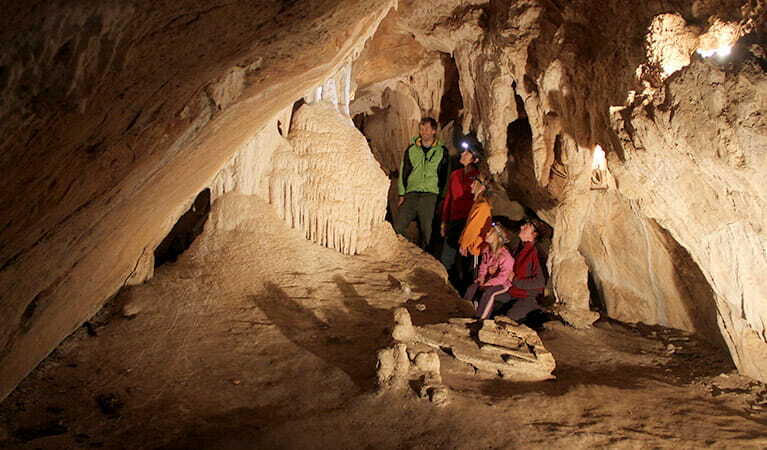 Join this guided tour at Abercrombie Caves to find out more. Bushrangers Cave tour, 2pm most weekends and daily during NSW school holidays. Abercrombie Caves open Thursday to Monday (closed Tuesday and Wednesday), and open every day during the NSW school holidays. Closed Christmas Day. Medium. Suitable for adults and school-age children. Tour includes moderate walk, climbing down a step ladder and crossing a suspension bridge. It takes about 1 hr 40mins. Adult $33 per person. Senior $30 per person. Pensioner/child $25 per person. Family $83 family for 2 adults and 2 children. Bookings not required. For further information email or phone Abercrombie Caves on 02 6368 8603. Minimum 2 adults required for tour to run. Bushrangers Cave was once used by the notorious Ribbon Gang, made up of escaped convicts and led by young English convict-servant Ralph Entwistle. The cave's remote location and narrow passages meant it was an ideal place for the gang to hide out. On this tour you'll also visit King Solomon’s Temple chamber, crossing a suspension bridge to reach it. Entry to Bushrangers Cave is by guided tour only. It's a good idea to wear sturdy shoes and bring a camera and a jumper (the temperature is cooler inside the cave). Bring a packed lunch if you're planning a day at Abercrombie Caves. There is no mobile phone reception in this park. Abercrombie Karst Conservation Reserve and caves are open Thursday to Monday (closed Tuesday and Wednesday). The reserve and caves area open daily during NSW school holidays. Closed Christmas Day. Contact hours: Thursday to Monday, 9am to 4.30pm. During NSW school holidays, 9am to 4.30pm daily. Closed Christmas Day.